i am working on my latest ‘idea’. i have a jacket pattern that comes in two different ‘styles’ – a flannel one that is not lined, but has finished seams and a reversible one that’s designed to make use of the large print & fabulously beautiful fabrics currently available. a lot of those are asian themed, and are the ones i generally use. i sell both the patterns and finished jackets (when i have one). i was in the process of making a flannel one to sell when it occured to me that i could sell it as a kit. these jackets are both made using 4 or 5 different fabrics. rather than cutting the pattern pieces from whole cloth, you create a new piece of fabric by sewing 2 or 4 of the fabrics together, rather like a mini-patchwork. i had completed all the patchwork pieces – which means i was ready to actually cut out the jacket. that’s when the idea hit. soooo, now there is a jacket kit! that one is packaged and ready to go to the next show. it is complete – everything you need to make your jacket – except for the pattern. i even included a couple of buttons to decorate the pocket flaps and the elastic for the sleeves. and the pockets are already made and ready to be sewn onto the fronts! the kit will sell for $75 and the pattern will be an additional $10 (normally $12). for the kit cover i took a picture of the piece from which you cut the back because the flannel jacket has all four fabrics on the back. here’s the picture i used. i have also, now, cut the pieces for 4 reversible jacket kits. for that one i won’t be including the fabric for the ‘lining’ (that which makes it reversible). i thought it would make the kit way too expensive, for one. and, secondly, i suspect many folks just might have a suitable fabric in their stash?? 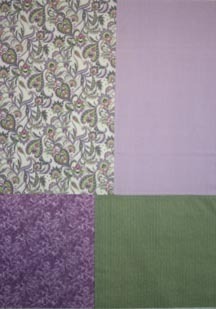 or they may choose to make another ‘patchwork’ type for the inside as well, and have a truly reversible jacket. i am including the trim fabric. and buttons for the pockets. and there you have it – my latest business adventure. i don’t have a show till end of this month (in ft. bragg, ca), so have plenty of time to finished these. i think the next project will be some mini’s – samples, that is. i still have a couple of dresses to embellish and it’s time to have some additional framed pieces for sale. funny how that last one won’t sell while it is the only one.